Merlin, Stitched in Time: Shoes! More Shoes! I think we can all safely agree that Lauren at American Duchess rocks. I also think she doesn't sleep. She has just released a new pair of glorious historical shoes! Well not just one pair but three! 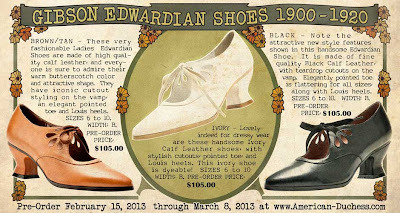 They are Edwardian shoes in three colors as seen above. Think of all the possibilities! Titanic, Downton Abbey, and numerous others too.